Flowers in terminal umbel; VIII-X; corolla white; ovary pale green, cylindrical, with uneven covering (mainly around upper part) of short hairs; anthers pale tan, with prominent awns; nectary ring green; habit bushy, low-growing heather, with pronounced tendency to produce "discoloured" (yellow) branchlets that gradually turn green; retains yellow (dis)colouring into late summer; long cilia (hairs) on margins of leaves and sepals usually not gland-tipped. This is only the second clone of Praeger's heath known to have white flowers (see Heathers 9: 76 (2012); Ericultura 163: 14 (2011)). The origin of this clone is not known. 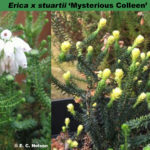 It has been grown in Connemara by Susie and Alan Kay from material given to Susie Kay by Dr John Griffiths, and in Norfolk by Dr E. C. Nelson. ® DME 2018-04 registered on 26 August 2018 by Susie Kay.